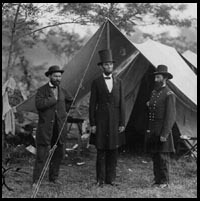 During the civil war, the union officers and enlisted men retained the black felt hat of the cavalry, but the trimmings were slightly altered. There were a variety of sources for the uniforms of the Confederates in the western campaign. Much of what the troops wore were civilian cloths of a wide variety. Head gear consisted of slouch hats, sombreros and various military hats. A number of captured union supply depots yielded current issue and earlier military uniforms. Those who entered service directly from the military or who were veterans often brought their old uniforms with them. When surplus or captured US uniforms were used they would do such things as turn the belt buckle upside down and turn coat s inside out to cut the odds of being hit by friendly fire. Brevet second lieutenants and medical cadets in the union army were prescribed uniforms differing not materially from those of the officers of junior rank. The forage cap which we have so often seen pictured in illustrations of the war, was fashioned of dark blue cloth with a welt of the same around the crown, and yellow metal letters to designate companies. Commissioned officers were allowed to wear these forage caps with the distinctive ornament of their corps and regiment in front. The officers and men of the acting Signal Corps wore the crossed flags. Non-commissioned officers wore the flags above the chevron. Their clothing was that of the cavalry.